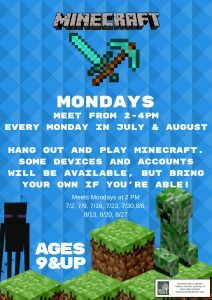 Meets from 2-4pm every Monday in July & August. Ages 9& up. Hang out and play Minecraft. Some devices and accounts will be available, but bring your own if you’re able! No need to register, but space and devices are limited, first come first serve.